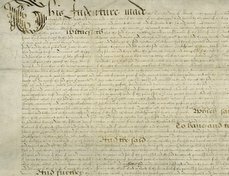 A surviving bundle of deeds, dating back to the mid sixteenth century, documents the ownership of the house in Henley Street adjoining the Shakespeare family property on the south-east. When freehold property changed hands at this early date, especially in towns, it was often the practice to identify it by naming the street in which it stood and, more precisely, which buildings it stood between. Thus, on September 20, 1575, as shown here, when William Wedgewood, a Stratford tailor, sold two adjoining tenements in Henley Street to Edward Willes, a yeoman of Kings Norton, they were described as lying between the tenement of Richard Hornby, blacksmith, “of the East part” and the tenement of John Shakespeare “of the west parte.” In fact, the street lies more precisely along a southeast by northwest axis. This sequence of property is repeated in a later survey of 1590, where Richard Hornby, John Willes (either Edward’s successor in title or his tenant) and John Shakespeare are listed, in that order, as holders of tenements in Henley Street. In that same survey John Shakespeare’s property is recorded as subject to a chief rent of 6 pence, thus allowing us, with some confidence, to identify it both as the tenement that he purchased from Edward West in 1556 from which the same chief rent was due and as the property adjoining the one, as shown here, sold to Edward Willes in 1575. 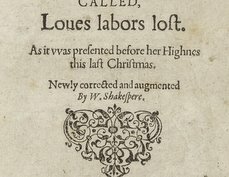 Also of interest is the use of the term yeoman to describe John Shakespeare’s occupation. John’s trade was first mentioned in 1556, when he was described as a glover. In 1561, when granted administration of his father’s estate he was described as a husbandman (agricola), and now, in 1575, as a yeoman, as he was on three subsequent occasions in 1579, 1580 and 1597. This expansion of his business interests is reflected in other evidence that by the 1570s he was involved in significant wool-dealing operations. Seven men witnessed the transaction, whose names are given in the bottom left corner of the second image, although they do not sign. Amongst them are the two next-door neighbours, John Shakespeare and Richard Hornby. Another witness was the ex-schoolmaster, Walter Roche, now a scrivener, who had drawn up the deed. John Shakespeare had also witnessed a deed of 1573 by which William Wedgewood had sold a piece of land behind his Henley Street house to Richard Hornby (TR 46/6/1). 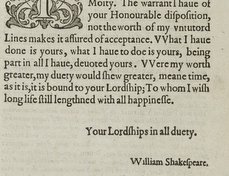 Subsequent deeds relating to the property sold in 1575 are helpful in confirming the Shakespeare family’s interest in the adjoining property. 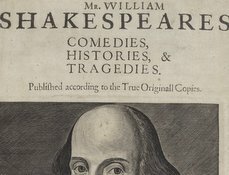 When the Willes family executed further deeds affecting the property, the property on the north-west (or “weaste parte”) was then described as once belonging to William Shakespeare in 1609 and 1613.